Red Team Alpha. An elite military unit. Twenty highly trained veteran warriors, Mars' best. They are capable, dedicated, armed with the best technology Mars has to offer. And they don't exist, at least not officially. Now the team will be called upon to face its greatest test. On a planet in a newly discovered system, there is a mysterious wreck, the remains of an ancient ship. The discovery is a momentous one, first contact and proof that mankind is not alone in the universe. For they are not the only ones who know about the ruins. Even now, the notorious Gavin Stark and his Alliance Intelligence forces are on the move, seeking to seize the ancient vessel and the priceless technology within for their own purposes. And they are ready to do whatever is necessary to gain the priceless ship...including wiping out Red Team Alpha completely. Roderick Vance is the head of Martian intelligence, a position he received after the suspicious death of his mother and father. Although he is young, and has little to no training in the world of intelligence, he is immediately tasked with a very important mission. The potential first contact with a sentient alien species. He sends in his best team to a foreign world to capture an secure the wreckage of an alien ship. Unfortunately he isn’t the only one with intel on the ship. The Alliance Intelligence, led by Gavin Stark, also knows about the ship based on word from a double agent inside the Martian Intelligence. Very quickly the story turns in to a race against time to see who will get there first, and who will still be standing. 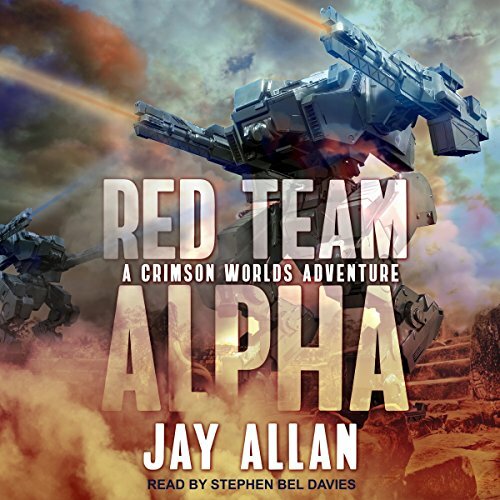 Red team alpha is a sect of elite warriors from mars. All battle tested. All with a record of success. That is, until Alex Vandenburg comes along. He is about as green as green gets. He passed all the tests with flying colors, and got an officers commission rather young, but there is a rule in Red Team Alpha. You have to be a combat veteran to get in. Vandenburg goes through not only the trials of joining a new unit, but also many interpersonal conflicts due to his “cherry” status. All in all, I really liked the story overall. Theres a lot of combat and suspense and a lot of the character interactions seemed realistic, however, the narration by Stephen Bel Davies left a bit to be desired. He did a pretty good job of narrating the story, but something about his voice just makes him really easy to tune out without trying. I found myself having to go back and rewind parts of the story, sometimes up to 10 minutes or more, because as he was talking, I just spaced out and didn’t realize it. Outside of that, his narration was good. Crisp and well done. As far as Jay Allen is concerned, I like the way he wrote the book. It’s kind of odd to jump in to a prequel series without having read the originals, but he did a decent job of covering all the important things that I wouldn’t have known otherwise without having read the first series. Overall, I really liked it and would consider listening to book 2 in this series. Especially if you have read the Crimson World series. I just love these multi series books. he never learned proper emphasis or vocal grammar. totally distracting from an otherwise entertaining story.